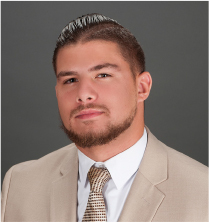 This month we’re happy to recognize Ahmed Mansour, Personal Banker II as our employee of the month. Based out of our Natick office, Ahmed makes a huge effort to get to know our customers. In addition to his rapport with customers, he has also maintained a great relationship with his colleagues. He even sends motivational emails to inspire his team. Join us in congratulating Ahmed! Steven M. Sousa, executive vice president and chief operating officer of MutualOne Bank and a MutualOne Charitable Foundation trustee, announced that the Foundation has awarded $4,000 to the Morse Institute Library to help expand and improve the Library’s Bookmobile services. Steven M. Sousa, executive vice president and chief operating officer of MutualOne Bank, has announced a $5,000 donation to the Natick Center Cultural District. The award was made at the conclusion of the Bank’s 2018 Checking for Charity initiative, which promised a $10 donation to be shared equally by the Natick Center Cultural District and Downtown Framingham, Inc. for every new personal or business checking account opened during the year. The Natick Center Cultural District promotes an active and dynamic arts and cultural presence and a vibrant, contemporary fusion of art, culture and business. According to Natick Center Cultural District Executive Director Athena Pandolf, the funds will support the ongoing Creative Placemaking initiatives that began last year and resulted in the “For the Love of Natick” weekend that added six temporary art projects to the downtown. “We are looking to expand on that this year, and implement some permanent artwork in Natick Center that will assist people in finding their way around town,” Pandolf stated. Celebrating MutualOne Bank’s recent donation to the Natick Center Cultural District are (l-r): Steve Sousa, executive vice president & COO at MutualOne Bank; Athena Pandolf, executive director at Natick Center Cultural District; and Colm Hamill, manager of MutualOne Bank’s Natick office. 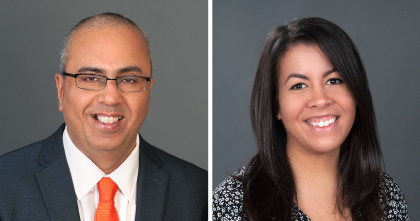 Congratulations to Personal Banker II, Jitender (Jay) Manjani, and Operations Specialist, Astrid Bachman on their selection as employees of the month. Jay is being recognized for consistently engaging with customers and his leadership in managing the lobby. Jay is a committed team player who is thought of very highly by his team members. We are happy to recognize Astrid because in addition to her regular job functions, she recently completed training in Fraud and Error Resolution Claims while also completing a report for the Technology Committee and Board of Directors. Both endeavors were labor intensive and time sensitive. Our January employees of the month both go above and beyond to make MutualOne Bank a better place to work and bank and we are very grateful for their efforts.